HomeThe BestThe best headphones for mixing beats | EASY! The best headphones for mixing beats | EASY! Finding out the best headphones for mixing beats isn’t that tough when we really get down to it. Before we dive right in, grab a snack, sit back and relax because..
I’ve been making beats on and off since 2007, and over the years I’ve gone through a lot of trial and error in my own studio. Check out my guide on How to build a home studio! (with pics). Originally I had the Sony MDRV150’s, which are considered old school now. They were a decent set, but the headband always cracked under pressure (like Henry Hill from Goodfellas :D). The first serious pair of headphones that I purchased were the Sony MDR 7506’s, which happen to be a phenomenal entry level set, and one that I will recommend in this very article. Sony MDR 7506 Review. The 7506’s helped improve my mixes tremendously, but they broke due to me being very immature at the time (Call of Duty rage lol). From there I purchased the Audio Technica ATH M50’s, and still have them. I do think the M50’s work well in studio, but their “reference monitor” moniker is a bit misleading in my opinion. They are more for the casual consumer looking for audiophile type quality. From there I invested in a pair of JBL LSR 305 studio monitors, and haven’t looked back. Having a good set of headphones for mixing, as well as an honest pair of studio monitors is truly priceless in studio. Some say you should only mix on monitors, but I disagree; I think there should be a balance. Sometimes headphones will reveal things that monitors won’t, and vice versa. JBL LSR 305 studio monitor review. That said, my research for a replacement mixing can has brought me to all ends of the earth, as I scour the internet to find out the best solution to my dilemma. Luckily for you, I have narrowed down the absolute best in terms of mixing down beats. Budget. What’s your price range? Are you looking for a headphone that will be in it for the long haul? Or do you want a quick solution now? Fortunately, a lot of the more affordable options are pretty darn rugged, and may last you many years depending on how you take care of them. 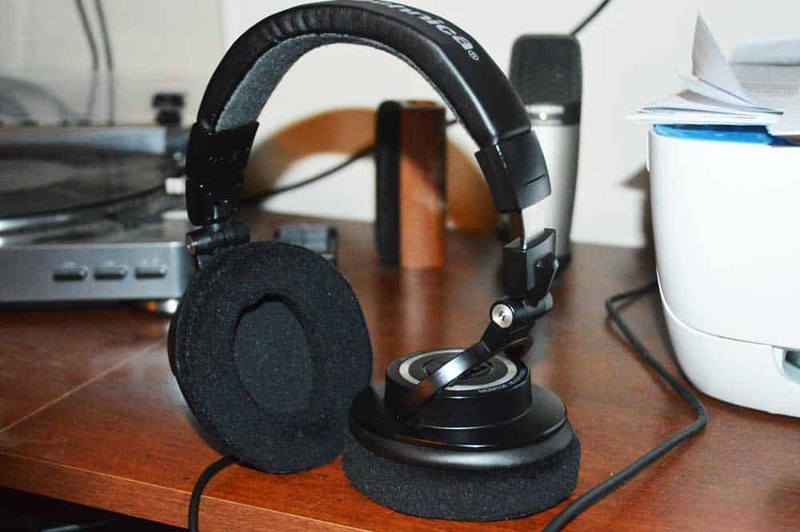 My M50’s that I mentioned have been going strong since Jan. of 2013. The only thing I have done is replaced the ear cups with some super comfy velour. Check out my Audio Technica ATH M50 Review! Open or closed back? With closed back models, the sound is trapped in and can become fatiguing, while open back headphones are more conducive to mixing for long periods of time because it has room to breathe (hence open). Closed back vs. Open back headphones. Studio Monitors. What are Studio Monitors? I love to mix beats on headphones as much as the next guy, but you may consider having both in your studio for reference purposes. I use my audio interface to go back and forth between headphones and monitors. It helps achieve a better final mix when it’s all said and done. Your Audio Interface. This little guy is pretty priceless, and what I like to call the backbone of your rig. It provides you with a 1/4″ headphone jack for all of you headphones with 1/4″ adapters, a way to hook up your studio monitors, and XLR inputs for your microphone. A great option is the Scarlett 2i2. Focusrite Scarlett 2i2 review. Impedance. What is Headphone Impedance? Are you looking for a low impedance model that will work with your portable devices? Or do you prefer a high end model that needs amplification? How to choose a headphone amp! Sound signature. All of the models I’m about to go over have a flat, neutral response that is best for mixing. There are no overhyped frequencies here. With that in mind, let’s get into some recommendations! AKG K550. AKG K550 headphone review. The best. Just be aware of the odd seal. You may have to play around with it to get the best fit. Sony MDR V6/7506. The difference between these two is minimal, but just know that the V6 has been around a lot longer. Basically what Sony did with the 7506 was appeal to the masses by adding more bass. Check out: Sony MDR V6 vs. MDR 7506! Also, the V6’s made my best headphones for mixing under $100. Highly recommended! Audio Technica ATH M40x. Good sounding set of cans, and pretty flat/neutral. Build quality issues and lack of comfort hold this one back from top honors however. Sennheiser HD 600. The King. The Gold Standard. I’ve talked about these ad nausea, but they will likely be my next purchase. A bit pricey, but well worth it. Needs a headphone amp, but not amp picky at all. Learn more in my official Sennheiser HD 600 Review! Beyerdynamic DT 880. Coming in at a close second, these also do extremely well for mixing, but the somewhat harsh high end holds them back. What does sibilant mean? Check out the best studio headphones for mixing for an in depth discussion on the top three listed here! Sennheiser HD 598. What would a best of list be without these bad boys? I had to include them. Think of these as a more affordable HD 600. They are a phenomenal set, and are extremely honest but also enjoyable. Keep in mind they are also very versatile, and are great for mixing because of that neutral sound signature. Should you buy the Sennheiser HD 598? Out of the headphones listed, the best is hands down the Sennheiser HD 600. No question. The issue with Closed back cans for mixing is that the sound gets trapped in your head, and over a long listening session it can get very fatiguing. I would definitely consider an open back over a closed back in studio for the purposes of this article or otherwise. Want to learn more about the 600’s? Well that’s about it for today my friend! I hope you’ve come away with some valuable information in this article concerning the best headphones for mixing beats! Do any of these headphones tickle your pickle? What do you think of my top pick? I’d love to hear from you.. The Best Headphones for Classical | FREQUENT FINDINGS!! I just searched for the best headphones and your website showed up. I think these headphones are too professional for daily casual use. Do you have a recommendation for an easy listener like me? I would love to have a headphone that cancels outside noise but delivers crisp sound. Somehow my ears can’t handle noise too well. I will have to lower down the volume but the sound is not clear that way. Good daily use would be the M50’s, and I’ve had them since Jan. 2013. Very durable, good longevity factor, tight deep bass. The frequency response is somewhat awkward around the mid bass region, but an otherwise phenomenal entry level audiophile type headphone for the average consumer. They aren’t noise cancelling, but act in the same way, blocking out the majority of outside sound while also not bothering people around you. A true closed back can.